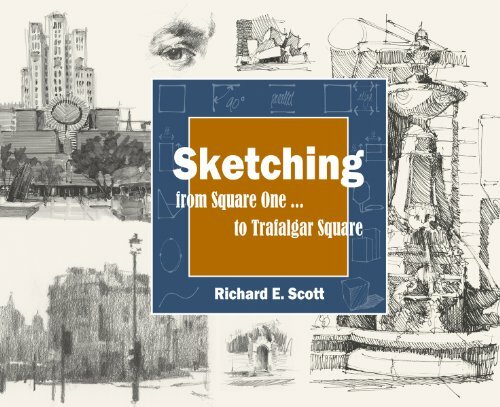 Sketching - from Square One ... to Trafalgar Square is an art instructional book on drawing written by Richard Scott, artist and architect. It's a book meant for beginners for it teaches the fundamentals of drawings. It's also for those who want to draw from observation because it covers a lot on that as well. Much of the examples are subjects from urban settings, buildings, etc. The book starts with lessons on proportions. Drawing from observation mostly comes down to observing proportions of the subject. So basically after these early lessons, you can get a good idea what's required to make a good sketch. Later chapters cover more specific subjects such as simplifying your sketch, bringing out the emotion, using edges, getting the accuracy, practicing tones and contrast. There are lots of visual examples, step by step tutorials, and the writing is clear and brief. Overall, it's a good book for beginner sketchers.